Thank god,alhamdulillah..everything is back to normal...I'm so relieved..To my close friends who knew what's been going on with my life lately,don't worry peeps,everything is back to normal.Thank you so much for Izza,for giving me the advice that I needed & it helped me a heck lot..huhu. My family,everyone of em' went to Johor to pick up my brother who's coming back while I am here because I've a date at 11.30..kah22..Date la sgt..More like tutoring date..sigh. 1)Red velvet cake-I've always crave to eat this cake but it's so hard to come by in Malaysia so I've found a tried & true recipe on the net from a food blogger & I'll blog about the baking process later this week. 2)Chocolate chip cookies-Click HERE for previous post. 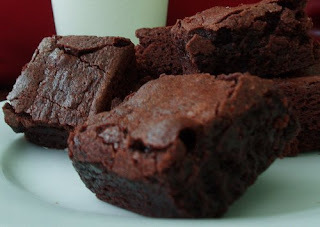 3)Martha Stewart Fudge Brownies-after reading The Star newspaper review last Sunday on the many kind of brownies available in Malaysia,turns out the Secret Recipe one,is not really a brownie so I'm going to make my own! *drools*.I bought it because it looked so bohemian & cool.Haven't worn the bag yet though..But it's dark brown leather & looks utterly delicious(yes,to a girl who loves bags,sometimes looking at it can be considered as delicious..LOL)..
Lately,I've been you-tube-ing Cinta Laura Kiehl a lot..I love her in Upik Abu & Laura,an indonesian sinetron that I follow with my mum..Her character is quite annoying in the series but I just love the fact that she has no qualms about making fun of herself..I even have her vid clip 'You say aq' song..hehe.The song is so bubbly..LOLsss..
thats a relief! thank god things are back to normal :) u owe me one helluva story! hehe. nways, something went wrong with my phone, so i cudnt forward u the number for you-know-what. so sorry for that. otherwise, i hope u can be like what i said, "the glue" of everyone and everything, ok? u can do it. "if things can go wrong out of a sudden, it can go right immediately too"
Practicum & The Sims 3!!! Kelakar + a change of heart? Fluff & Edu fac is moving!